The Corsair H100i Pro RGB is a closed-loop CPU cooler that’s combining magnetic levitation and RGB LEDs to bring you one of the best liquid chip-chillers you can strap to your processor. Obviously it’s the RGB LED component of the attached pump which gives it the necessary cooling performance, but those maglev fans are none too shabby either. When you’re talking about all-in-one (AIO) chillers it’s increasingly tough to look past the range that Corsair is able to lay out on the table as offering some of the best liquid coolers. 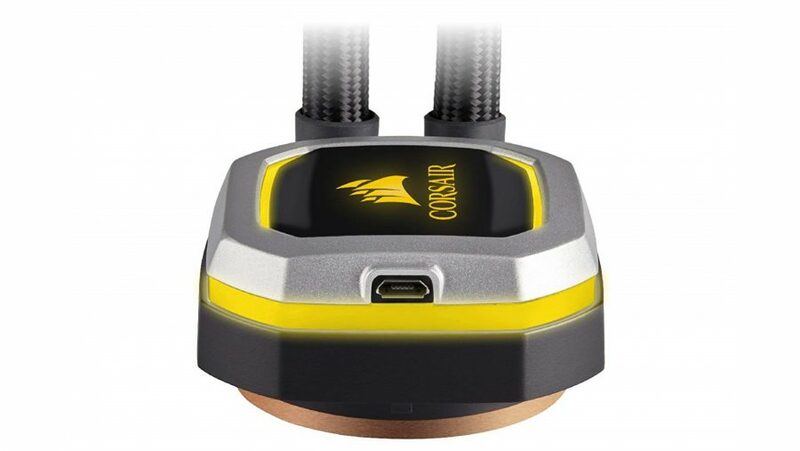 Once a company dedicated to memory alone, Corsair has expanded its reach into myriad different areas of the PC gaming business and has actually managed to reach the top in surprising places, CPU cooling most definitely being one of them. The H100i Pro RGB will be instantly recognisable to any Corsair cooling aficionados; it looks almost identical to the classic H100 except for a slightly smaller radiator, thinner coolant tubing, and those LED lines around the pump. But that’s no bad thing, the standard 240mm AIO design is tried and tested and the H100 design has been one of the most popular for a reason. 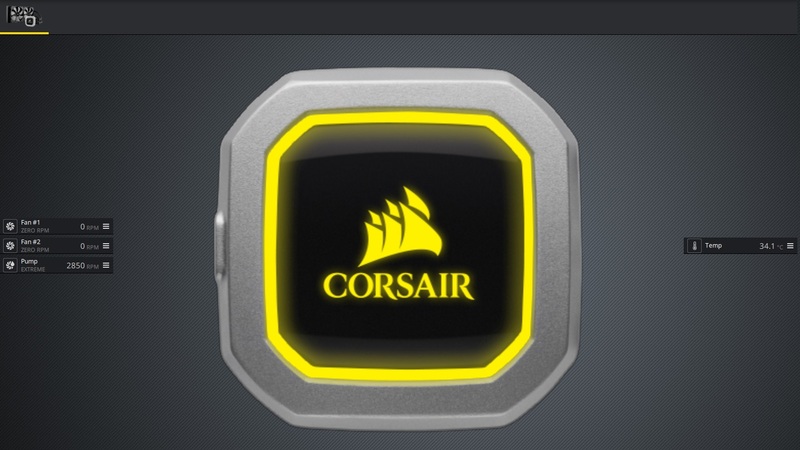 So what do the updates mean for the new $100 / £100 Corsair H100i Pro RGB? The most obvious is that extra LED flair. 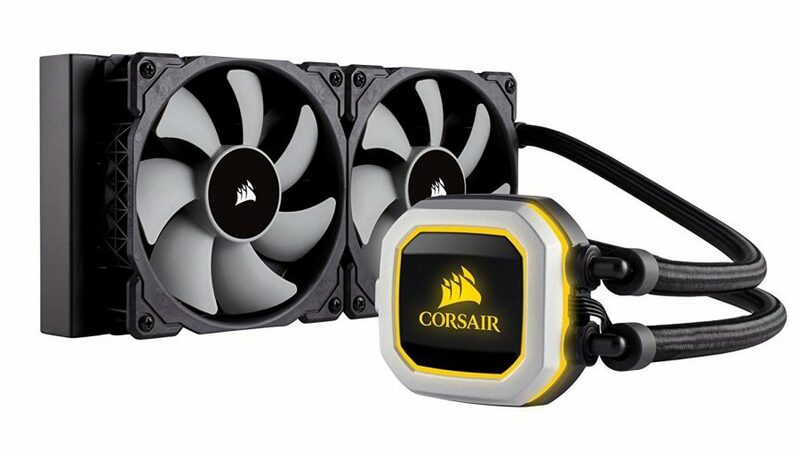 It makes zero difference to your PC’s actual performance, but you can use it as an indicator for the temperature of your chip or coolant, or just have it plumbed into the Pink Floyd-esque light show you’ve created using your other Corsair components. It’s still sporting essentially the same 240mm radiator despite its more slimline dimensions. The millimetre cuts to the z-height and width of the radiator have been made to ensure that it fits less snugly and more comfortably in small form factor chassis like Corsair’s excellent Crystal 280X case. The trimmed sides shouldn’t really have any impact on the radiator’s ability to chill the coolant or the CPU, what does seem to make a difference is the thinner tubing that Corsair has used on the new Pro RGB version. The previous H100i v2, which we still use as the main cooler on our test bench, has pretty chunky tubes, and it feels like those could be making a difference to the relative cooling performance that we’ve seen between the two on the same Z370 / 8700K testing platform. There’s not a huge amount in it, but the general cooling performance of the new H100i Pro and the H100i v2 is ever-so-slightly worse. The idle performance with the Core i7 8700K running at stock speeds is a good few degrees centigrade higher with the Pro RGB chiller, though only a couple higher at 100% CPU load. The peak-to-idle performance is pretty close at stock performance, but it took much longer for the H100i Pro RGB to bring the temperatures back down to idle levels from 100% CPU load when we had the 8700K overclocked to 5GHz on all cores. But while cooling performance is important for a CPU cooler, it’s not the only thing that matters. And that’s where the Corsair maglev fans come into it – they’re so much quieter than the standard bearing fans used on the previous model that you can run them faster and still have the same noise level. Even running them at 2,400RPM – you know, when you really want to thrash the living poop out of your CPU – they’re not insanely loud. I mean, you probably wouldn’t want to have them running at that pace for the entire time you’re using your PC, but tonally the pitch is low enough to not be utterly offensive. The real kicker for me, however, is the inclusion of the Zero RPM mode, accessible via the funky iCUE software. Think about the 0dB functionality of most recent third-party graphics cards and you’ll be on the right track. When the CPU isn’t being hugely taxed, and the coolant stays below the 35 – 40°C mark, then you can configure the fans not to spin at all. This is great for gamers, as a huge number of titles don’t really make full use of your CPU’s cores, and for the most part the H100i in passive pump mode can do the job sans fan. The idle temps go up a bit, hitting around 45°C instead of the 34°C we measured as standard, but that’s still a comfortable level for your chip to live with. Obviously when you start to push your CPU a little more then things do get toastier, and the fans will start to spin around the 40°C point for your coolant. To begin with they’ll only kick in at around 400RPM, but if you maintain load, iCUE will push the fans to the max to compensate. While I’m not necessarily that bowled over by the general cooling performance of the H100i Pro RGB, the actual experience of using it – especially as a gamer who isn’t going to be 100%-ing their CPU 24/7 – is excellent. And sometimes almost silent. Not the best outright CPU cooler, but one of the quietest liquid chillers out there, and one that is still capable of coping with the big boys of the processor world.